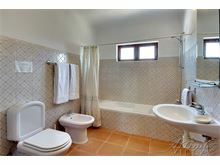 As Nossas Rochas is situated in a prime location just 650m from the centre of Carvoeiro and 350m from the nearest beach. Please note Paraíso Beach access was recently collapsed from a storm and hasn't yet been replaced. Situated all on one level, this simply furnished villa is very comfortable offering plenty of space with a large open plan living dining area leading out to the covered terrace with its excellent sized pool. 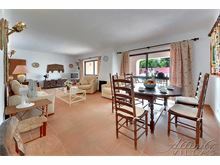 With the benefits of local restaurants and bars on the doorstep and a short walk down to the centre of Carvoeiro village, this is an ideal villa for those not wanting to rely on a car all the time and embrace village life in this very popular seaside resort. 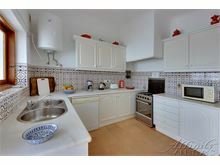 Approximately 500m from shops, restaurants and beach. Entrance into kitchen area with microwave and dishwasher, leading to open plan living and dining room with patio windows to pool terrace, TV, DVD and stereo. 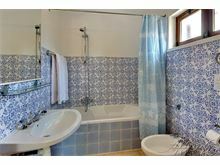 1 twin bedroom and 1 double bedroom sharing a bathroom and a further double bedroom with en-suite bathroom. Covered terrace with brick built barbecue, roof terrace with sea views, garden with small fish pond and pine trees, laundry area housed in garage. Maid service 3 times per week. 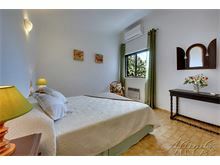 Air conditioning (bedrooms only) and WiFi are available at extra cost, if required. Had a wonderful week here with partner and teenage daughters. 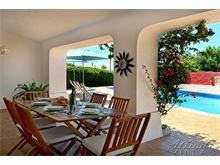 Villa is in a nice quiet area but close to a handful of restaurants if you don't fancy walking into town (only a short walk away anyway and once there, you're spoilt for choice). Best bit about the villa is the fantastic pool - much larger than you'd expect for accommodation this size and we tended to use the outdoor patio area almost exclusively. Inside the villa is very comfortable. The villa manager, was charming, she was really friendly and helpful. All in all, it was a fantastic holiday in a great location and for first timers in a villa, we'll definitely be doing it again. Great location, quiet, yet in easy reach of town. Attractive gardens, good size pool. Maid service was thorough. Have now stayed at this villa twice and would happily return again. 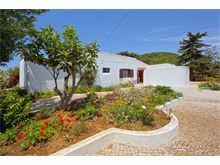 This villa is ideally located close to Carvoeiro, with good restaurants and an excellent cocktail bar within a couple of minutes walk. The town is only a 10 minute walk, but it is uphill all the way back! The pool is excellent, and the grounds are generally well kept. Overall this is an excellent place to stay if you want to be close to facilities and have a nice big pool to lounge around when you feel the need! The villa isn't very modern but is clean and comfortable. The pool is a great size, the villa had everything we needed and we had a fab time. This is the second year we have booked with Affinity and from booking to arriving everything was clearly explained which led to a very enjoyable stay. Thanks to the team again. Villa was great, clean, good facilities and location. 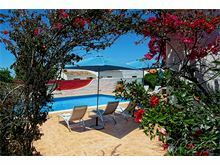 Lovely villa with a fabulous pool in a great location within easy walking distance of Carvoeiro's many shops bars and restaurants. Comfortable and clean beds and a lovely comfortable lounge. Good bathroom facilities and adequate kitchen. Loved the pond and the frogs! Villa was well equipped, and felt really spacious ,as did the gardens and pool area, a pleasant and tranquil residential neighbourhood, though still very close to town/beach. We very much enjoyed our stay. Lovely Villa close to shops and beach. Fantastic pool which we all enjoyed. This was our second visit and would definitely come back again. 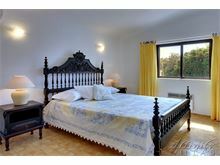 As Nossas Rochas was excellent for our family holiday, it is big and roomy & has everything you need. The pool was big and clean with enough loungers for 6. The lounge was airy & comfortable & the bedrooms were clean & air conditioned. The facilities, washing machine, fridge freezer, cooker & microwave etc were all in good condition & working fine. All in all the villa was a lovely base for our holiday in Carvoeiro. Overall the villa was fantastic, the location and the pool, great. The service we received was absolutely excellent and now that we are home and have compared our experience with others who booked with other villa companies, we realise just how good it was. There were a few small issues with the villa but the House Manager sorted these out without delay and was on-hand and very helpful. I would, and have, recommended Affinity Villas to family and friends and will without hesitation book with them in the future. We had a lovely week, location is very good. This is the third time of using Affinity Villas and was once again happy with service and information given. 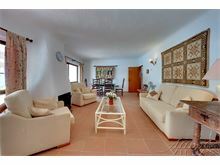 Pleasant villa in a very good location, easy walk into the village and some excellent restaurants only minutes walk away. Thoroughly enjoyed my stay and will be returning next year. Lovely villa with an impressive sized private pool. Short walk into down (hilly walk back!) and some restaurants nearby. A wonderful over all experience. Absolutely blown away. Will definitely book again. This was our 4th visit to this villa and once again we thoroughly enjoyed our time there. The location is excellent, being in close proximity to the local town and easy walking distance to good restaurants and bars. 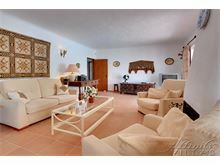 The villa is spacious and perfectly functional, the pool is large and a blessing in the summer!! Overall a great place to stay. Lovely villa in an excellent location with bars and restaurants nearby and the centre of Carvoeiro only a 10 minute walk down the hill. For those not wanting to walk back a taxi back only cost €5. Beautiful gardens and a fabulous swimming pool, would recommend. Very convenient for town. 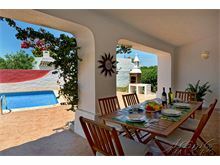 Basic villa that met our needs (four adults and a child, although two kids could have been easily accommodated). Very comfy poolside loungers!